You do not need money to generate creative ideas, but you do need a stimulated mind to create wealth. The mind is the storehouse for great inventions, but the Earth can only yield its full promise when you engage its power. 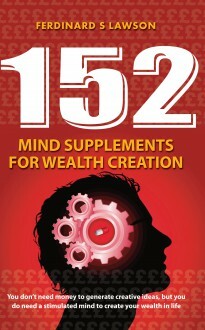 This book is designed to provide the reader with the necessary mind supplements to use that power for wealth creation. It will stimulate you to discover and develop your talents so that you can develop a leadership mind-set and add value to people around you. With its help, you will learn how to enhance your productivity and free your creative mind to work harder to provide ideas for wealth creation. 152 Mind Supplements for Wealth Creation has been written to show you how to achieve the success of which you are truly capable.